Soyuz MS-11 launch with the Expedition 58 crew onboard including Canada's David Saint Jacques. Credit: NASA/ROSCOSMOS. Many held their breath as the countdown to launch reached zero, but with a continuous roar the engines of the Soyuz MS-11 rocket lifted off with the crew of Expedition 58 and Canada’s David Saint Jacques for a six hour ride to the International Space Station (ISS). The launch from the Baikonur Cosmodrome in Kazakhstan to the ISS at 6:31 a.m. EST Monday, Dec. 3 was a picture perfect. If you hadn’t known that just six weeks ago another Soyuz with a crew of two astronauts didn’t succeed in reaching orbit, but did manage to escape in their capsule and land jarringly, but safe, mere minutes after the aborted launch. The crew are now performing routine orbital tasks as they head towards their rendezvous with the ISS in about six hours. Update 2:45 p.m. EST: David Saint-Jacques and his crewmates entered the International Space Station at 2:37 p.m. EST. With the hatch being opened at 2:37 p.m. EST, David Saint-Jacques is seen entering the space station. Credit: NASA. 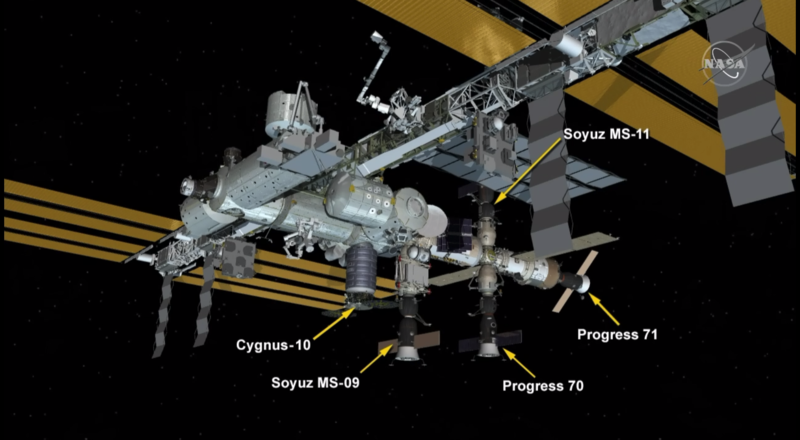 This diagram shows the location of the Soyuz MS-11 spacecraft docked to the International Space Station. Credit: NASA. Previous Where Will Canadian Astronauts Fly Next?